John Robertson & Harriet Hiemstra work and play together in their picturesque Cobble Hill studio, where they enjoy spending time with each other and their 14 year old son. A sense of artisitic adventure, along with a love of the whimsical have created a wonderful blend of the fanciful and the practical in Harriet's work. Bold one-of-a-kind pieces evolve under Harriet's precise hand work with different clays and bisques. Her richly detailed tiled tables and wall sculptures in sumptuous glazes draw inspiration ranging from classic Greek sculpture to Russian Icons. Harriet enjoys taking walks in the Vancouver Island sunshine and doing yoga. John exlpores a wide range of glazes and underglazes to produce quality and contemporary pottery that becomes the perfect blend of function and art. His use of colour and natural designs under his distinctive brushwork is a reflection of his seaside surroundings. 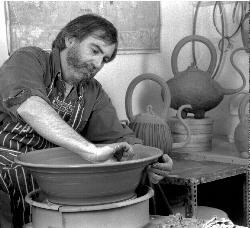 With his training and background as a painter and potter, John sees pottery as an evolving art rather than a static craft. In his spare time, John plays bass guitar in a band. John's art training shows through in his sculptural work shown here. 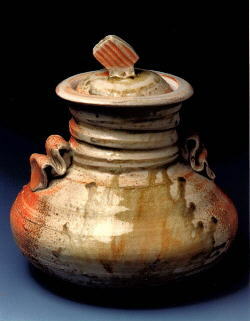 John also creates a colourful line of functional pottery. 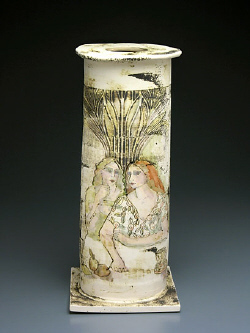 The female form is often seen in Harriet's painterly work, as shown here in this hand done vase. She also makes a collection of functional slab-built tableware. Here is another example of Harriet's exceptional female 'paintings on clay', representing the joyful aspect of clay - pure play! 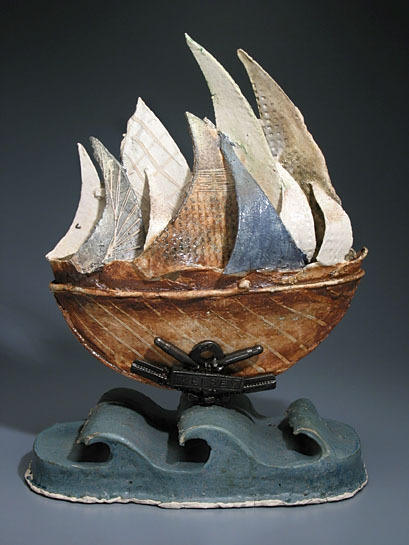 This piece is earthenware and shows off Harriet's love of form. John often take time out of his production cycle to create these one-of-a-kind covered jars with strong design and interesting colour. 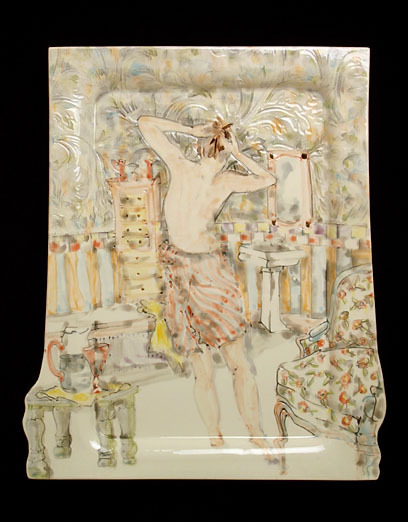 He constantly explores surfaces and glazes to offer new and exciting pieces.